Leading with the lore, it's possible that this card is in reference to SM-65 Atlas, which was the American response to the Soviet R-7 Semyorka. It was a long range ICBM (intercontinental ballistic missile) that attempted to match Russia's intercontinental capabilities; in effect it put the entire Earth at risk of nuclear apocalypse. Given Weyland's American theming (see: Wendigo, Ireress, Student Loans, space ice, etc.) it's quite possible Atlas is in reference to this. 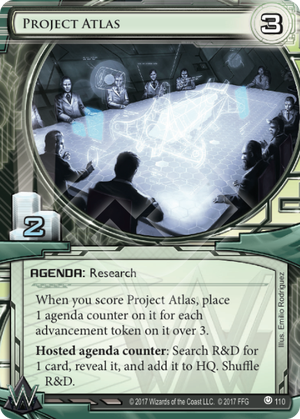 In terms of game mechanics, Atlas might be Weyland's most powerful agenda at the time of this post. It's the faction's only 3/2, similar to AstroScript Pilot Program and Project Vitruvius, and has an extremely potent ability to boot. Putting three Snare! into a deck and having one Atlas token scored grants the corporation unfathomed reach in penalizing the runner for their mistake. This interaction was encapsulated in the tournament-style Supermodernism, which has seen revitalization due to Titan Transnational: Investing In Your Future ability to score an Atlas with a free counter. It's also quite possible to use Atlas as an empty threat, a "vegan" Weyland, without meat damage. When the corp is in a strong position (I like Akitaro Watanabe and Chimera personally) it's possible to chain together Project Atlas by summoning a new agenda with each token. With enough funds (what is Weyland without lodsemoney? youtu.be) the corporation can surge to 6 points in the blink of an eye; one Hostile Takeover is all it takes to win the game after that point.